If Count Basie were a trial lawyer | Jon Katz, P.C. Count Basie was a great jazz pianist and big band leader. As with most musicians who pour their hearts into concerts, nothing beat experiencing him in person, which I did twenty-four years ago, wowing me at an outdoor performance. 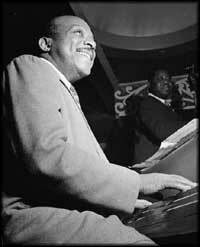 Basie took his time playing the piano, ordinarily economical with his notes and deliberate with how he played them. One story went that one day someone challenged him about whether he even had the ability to play fast. Apparently irritated, Basie responded with piano playing so fast, furious and still skilled as to erase any such doubts about his musicianship. Many times, lawyers voice their frustrations over unreasonable time limitations placed by judges on their jury selection, closing argument, and other critical presentations. I imagine that judges will be more liberal on such limitations when they know the lawyer and opponent are as skilled with word economy as Basie was with playing notes. The notes not played and the pauses taken can be as important as the notes played and how they are played. As much as it is important for a trial lawyer to be in the moment in court, that does not equal coming up with words and arguments at the spur of the moment. That work should be done as much as possible in advance, and excess verbiage should be pared down, so as to becomes a stepping stone to an in-the-moment argument that is tighter, more confident, and more persuasive than just getting up and winging the argument. Our clients and witnesses also are well advised to take a page from Count Basie, and to err on the side of being too brief on the witness stand, as long as each question is fully answered. Too many clients and witnesses over speak from the witness stand because they get nervous, non-trusting whether the lawyer will ask the right questions and object to the opponents’ inadmissible questions, non-trusting whether the judge and jury will remember what the witness said in the first place, caught up in any habit of over speaking, and sometimes just caught up in verbal diarrhea to make up for any lying testimony. Perhaps they need to listen to Count Basie in their testimony preparation, while also being helped by the trial lawyer to develop a more trusting relationship between both of them and with everyone else (except to have sufficient caution about the opposing counsel). In their essential Cross-Examination: Science and Techniques, trial masters Roger Dodd and Larry Pozner talk about the power of silence (sometimes as simple as walking to counsel table, pouring a glass of water, and taking a few sips, which sometimes also provides additional time to ponder a difficult hurdle) as well as the power of looping to lock in witnesses and to help jurors remember essential information. However, the looping should be done with an effective purpose, and not for the purpose of annoying the judge and jury as if the lawyer thinks they are idiots with short attention spans. Hamlet very deliberately and slowly proclaimed: “To be or not to be. That is the question.” In so doing, everyone paid attention, and still does. I once read about a man in India who voluntarily went silent many years ago, and writes nothing more than will fit inside the small chalkboard he wears around his neck. If he were Hamlet, would he have merely wrote: “Should I commit suicide?” Jon Katz.